ignated the KH-17 with a 300 hp Jacobs R-755 engine in the nose. It also had two additional 150 hp Lycoming engines with the propellers turning in opposite directions mounted in stub wings on either side of the fuselage. It was flown once or twice with only the center engine and without the wings. The project was abandoned because of high control stick forces. 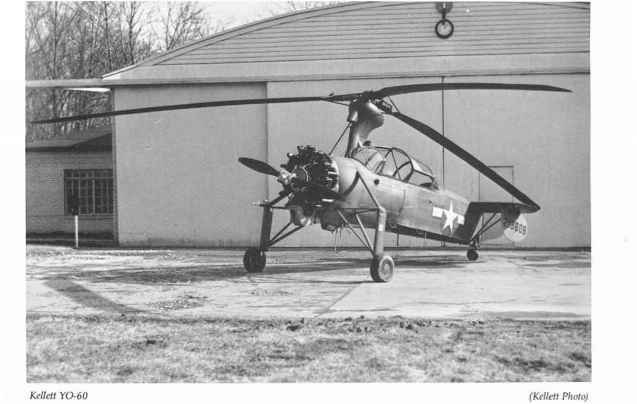 The rotor blades used were the front rotor blades from a Piasecke HUP helicopter which was a tandem rotor helicopter, A feathering rotor control system was used instead of the KD-1 type tilting head. 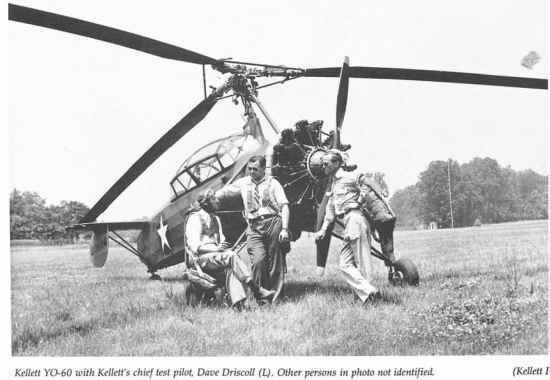 Kellett YO-bO with Kellett's chief test pilot, Dave Driscoll (L), Other persons in photo not identified. The Army Air Corps liked the YG-1B but needed more power and more useful load. Above all, they wanted vertical takeoff. This was 1940 and the helicopter was not yet available. Although the Air Corps had a helicopter under construction, its usefulness was yet some time away. The proposed X0-60 (Kellett did not assign their own model number to the YO-60} it was a growth version of the KD-1A. 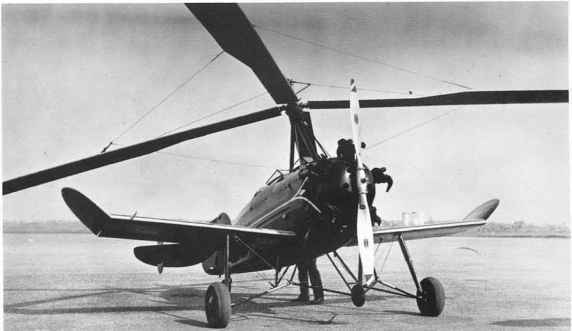 The rotor system was similar to the KD-1A, using the same type blades and familiar construction. A heat-treated 4130 steel tube was the main member, with plywood ribs and 1/32" plywood cover. Some Y0-60s were flown with slightly different blades with tapered thickness and plan. These had step tapered spars and were fabric covered instead of 1/32" plywood covered. The leading edge back to the spar tube was plywood covered. The rotor system was different with the addition of the hardware necessary for jump takeoff. The blades were set at "no lift" angle for runup. The rotor was speeded up to 280-290 rpm about 80 or 90 more than the cruise rpm. When the clutch was released a counterweight on each blade twisted the blade upward to abo degrees. Then, as the rpm bled off, the a came back to 3 degrees. At this time, the i giro should be at about 10 feet altitude. 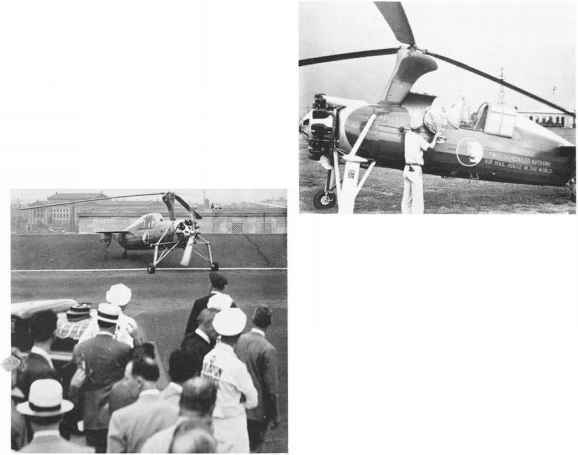 Reli of its rotor load, the engine came up to tal rpm and flew the Y0-60 off the top o: jump. 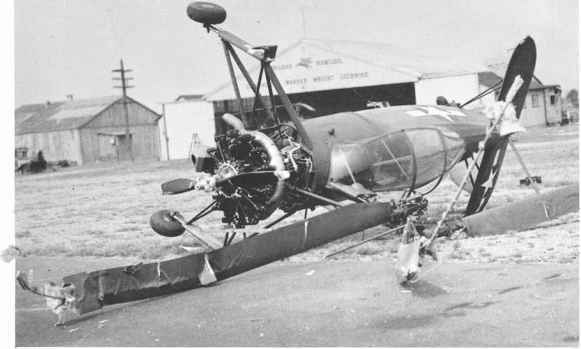 There was one problem of jumping a ta ting autogiro. Because the tail was down rotor was tilting slightly aft. 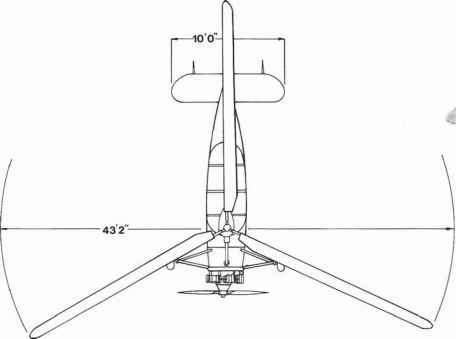 When the ta' did take place, the aircraft actually jumped t wards and the propeller had to overcome th tie bit of backward inertia before forward t! could take effect. The same rotor arrangement as YG-1 s was retained, but the motion dampers that inside the blade spars as in the KD-l/YG-1 to be assisted by dampers attached from b!a blade near the roof end. The power takeoff for the rotor spinup improved. There had been many problems the leather faced clutch on earlier models clutch would either slip and chatter or t release completely. When the shear pin i: vertical shaft did not shear as it was suppos« damage could be done to the drive shaft.